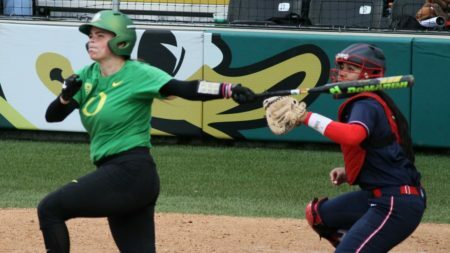 Oregon’s 5th-ranked softball team dodged the rain showers and dismantled the 9th-ranked Arizona Wildcats with a three game series sweep at Jane Sanders Stadium. Friday’s opener was a classic pitchers’ battle with Oregon’s Megan Kleist and Arizona’s Taylor McQuillan battling pitch by pitch through six innings. Oregon took a 1-0 lead in the second on a Gwen Svekis home run and Kleist tossed zeroes until the Wildcats knotted the score in the sixth on an unearned run. Svekis and the Ducks responded immediately with the senior catcher belting her second bomb of the game – a three run blast that came at the end of a 10-pitcht at bat. Shannon Rhodes followed with a solo shot of her own. Needing three outs, Kleist yielded a run but after a quick visit from head coach Mike White, retired the side to pick up her 11th win of the year. The junior right-hander struck out seven and didn’t allow a walk. With a three run first and a two run fifth, the Ducks had Saturday’s game two well in hand thanks to Miranda Elish who had blanked the Wildcats for five innings before rain halted play. When play resumed Sunday, Elish struck out the side in the top of the sixth then picked up her 13th win of the season when her offense added three more runs in the home half to run rule Arizona 8-0. Svekis, Alexis Mack and Mary Iakopo each picked up a couple of base hits to lead the Oregon attack. With game two in the books, attention then turned to Sunday’s regularly scheduled finale. Kleist was again masterful in the circle, holding the Wildcats to 1 hit while striking out ten to give the Ducks the sweep. Oregon scored a pair of runs in the third and the fourth innings and was leading 4-0 after six when the wheels came off for the Wildcats. A pair of walks, a pair of wild pitches, a fielding error, a double down the left field line and three run Mary Iakopo bomb sent the Wildcats hightailing it back to Tucson wondering just what kind of truck it was that had hit them. With the sweep Oregon’s record is now 32-6 overall and 7-2 in conference play putting the Ducks in a tie for second place in the standings with Arizona State, Oregon’s next opponent. Washington leads with a record of 10-2. After traveling to Tempe to face the Sun Devils this weekend, Oregon returns to Jane Sanders Stadium to host Oklahoma in a non-conference heavyweight match-up on Thursday, April 19 at 4:00 pm. The post Ducks Go “Boom” – Bury #9 Arizona Wildcats With Series Sweep appeared first on DuckNews.com. Next Story Next post: It Was Their Month In History, But Why didn’t We Know About Them?